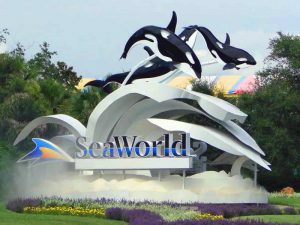 SeaWorld Entertainment Inc. (NYSE:SEAS) has revealed that the company is the subject of multiple federal investigations. Two federal agencies are reportedly investigating SeaWorld over statements about the 2013 “Blackfish” documentary “and trading in the Company’s securities.” SeaWorld has reported falling revenues for the last three years. According to Securities and Exchange Commission filings, the agencies subpoenaed statements made by the company and its executives on or before August 2014 regarding the impact of the anti-captivity documentary. In August 2014, SeaWorld shares fell 33 percent in a single day after the theme-park operator reported earnings that missed analysts’ estimates. The company blamed the fallout from the anti-captivity documentary for the earnings miss. The 2013 documentary chronicled the life of Tilikum, an orca held in captivity at SeaWorld. In 2010, Tilikum killed a SeaWorld trainer during a performance in Orlando. The documentary focused on the treatment of killer whales in captivity and quoted animal rights activists that said that the large animals were inhumanely treated by keeping them in small tanks. SeaWorld has been struggling in recent years due to the negative publicity brought by “Blackfish”. The documentary led to widespread criticism of the marine park operator. Since the release of the documentary, a series of campaigns and proposals have been launched regarding captive killer whales. SeaWorld has since made changes to reflect the public’s concerns. In 2015, SeaWorld decided to end its killer whales show and to showcase them in their natural setting instead. SeaWorld also announced a decision to stop the breeding of orcas in captivity in 2016. SeaWorld Chairman David D’Alessandro, who was voted out by at a shareholder meeting this month, will continue as the board’s non-executive chairman till Dec. 31. While D’Alessandro offered to resign immediately, the board decided to postpone his departure in light of the challenges facing the company, including the federal investigations.